This it the second installment in a series (Part 1) about the build out of Module 1, lower level of the L&NC. 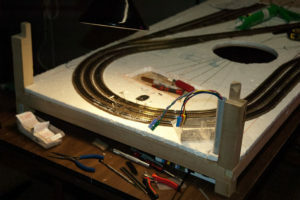 This series covers all the basic steps I’m following to install all wiring, electronics and mechanical objects throughout the layout, so in subsequent phases of this project I can focus on the unique aspects of other modules. 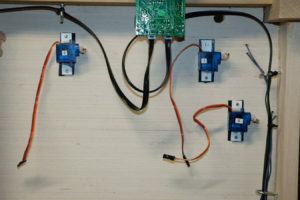 Step 1 was to install the basic wiring trunks and connection points, create track power distribution nodes then connect track feeders to the nodes. I tested the track with one of my most challenging locomotives—a Broadway Limited EMD E8A DCC with Sound. I say “challenging” because it has two 3-axle trucks, a long wheelbase and no big capacitors to buffer track power, making it susceptible to derailment or operational problems with faulty track. If this loco can run a stretch of track problem-free, it’s good track! Naturally I found and fixed a few (cough …. ) places where there were problems. Correcting track problems for flawless running. 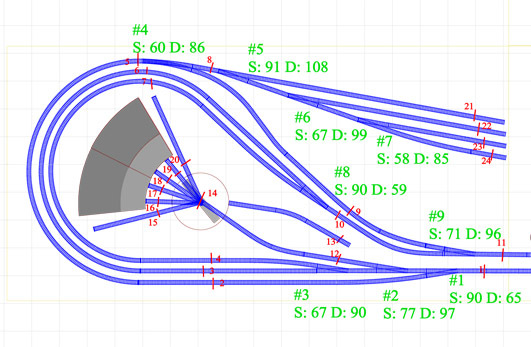 After tinkering with the problem zones, I realized that the “course of least resistance” was to rip out and re-lay a few short strips of track. The caulk adhesive track laying method makes this a piece of cake: after cutting the rails, run a long bladed knife under the track section you want to remove and its free in seconds. The ease of fixes really adds incentive to be fussy at this stage and get it right. I had everything in good order in a couple of hours including drying time for fresh caulk adhesive. The next step is to mount the servos running the 9 turnouts on this level. Installing them now is the best way to ensure they have the space they need for normal operation and maintenance. Servo mount on the Test Loop. I’ve previously done a basic demo of the mounting method I used on the Test Loop. I chose that particular mounting method because it simplified the connection between the servo and the rod connected to the turnout; the rod fits easily but snugly through the hole in the horn. In this mounting method the base plate of the mount provides the fulcrum or pivot point for the rod. Turnout operation on the Test Loop continues to be 100% reliable. The only issue with that mounting method is that noise is transmitted to the layout through the mount, so servo operation is noisier than it should be. In addition to noise control, the equipment space beneath the layout level is about 1 3/4 deep, the width of a 1″ x 2″ frame member. For both protection and aesthetics, I need all equipment to fit inside that space. The old servo mounting method requires more space than that, and would stick out below the edge of the frame. The solution is to mount the servo on its side, allowing the horn to rock a rod back and forth setting the turnout points. Several obvious ways to do that came to mind. But I also wanted to make sure that alignment of the servo is easy and foolproof. I drilled holes for the turnout rods when I laid the track. To make installation and alignment of the servo easy, I drilled the holes so that the rod would be in the 90 degree position (perpendicular to the plywood base) with the points aligned one direction or the other. I tried to keep the holes through the plywood small to serve as fulcrums (mostly succeeded), then widened the holes in the foam and roadbed beneath the track so the rod can swing between the two positions of the points. I inserted a 3″ rod cut from 1/16″ music wire (you need a hard wire cutter for this stuff) and made sure the positioning of the rod was correct. 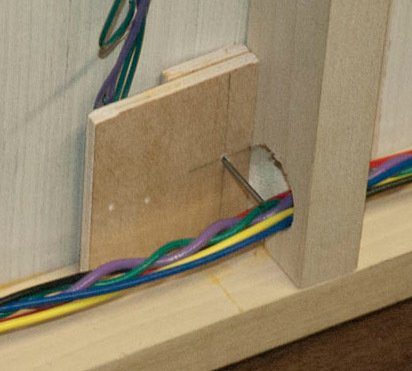 The advantage of the music wire is that it can flex without deforming, allowing you to apply pressure to the points. 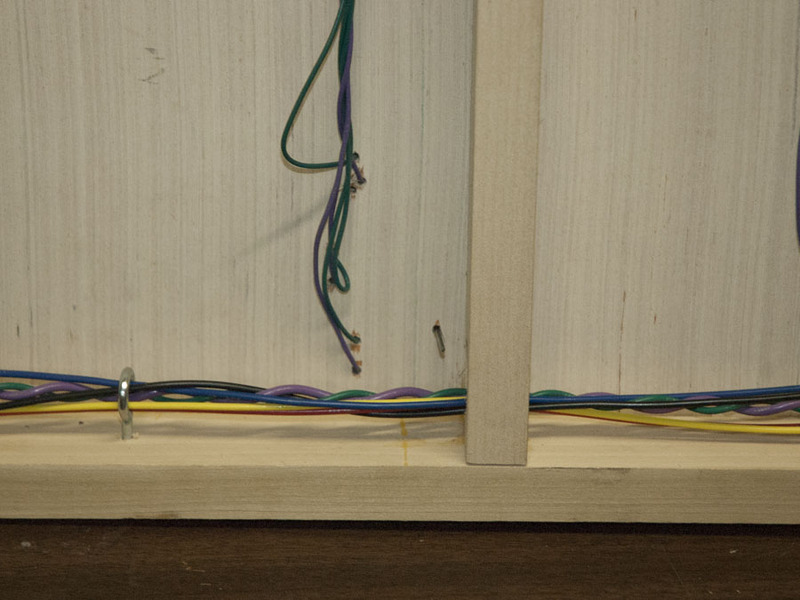 That said, 1/16″ music wire I’m using is fairly stiff in the short lengths needed here. 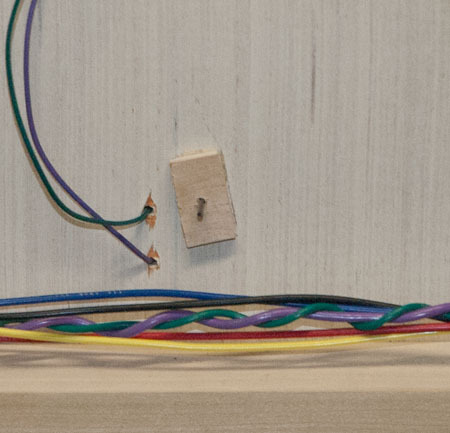 It is stiffer than the wire typically use with stall motor turnouts, stiff enough that it easily overcomes resistance from the built in springs in the Peco turnouts I’m using on this layout. Many people recommend removing the positioning springs in Peco and similar turnouts, since they can cause turnout movement to pause while overcoming resistance of the spring. 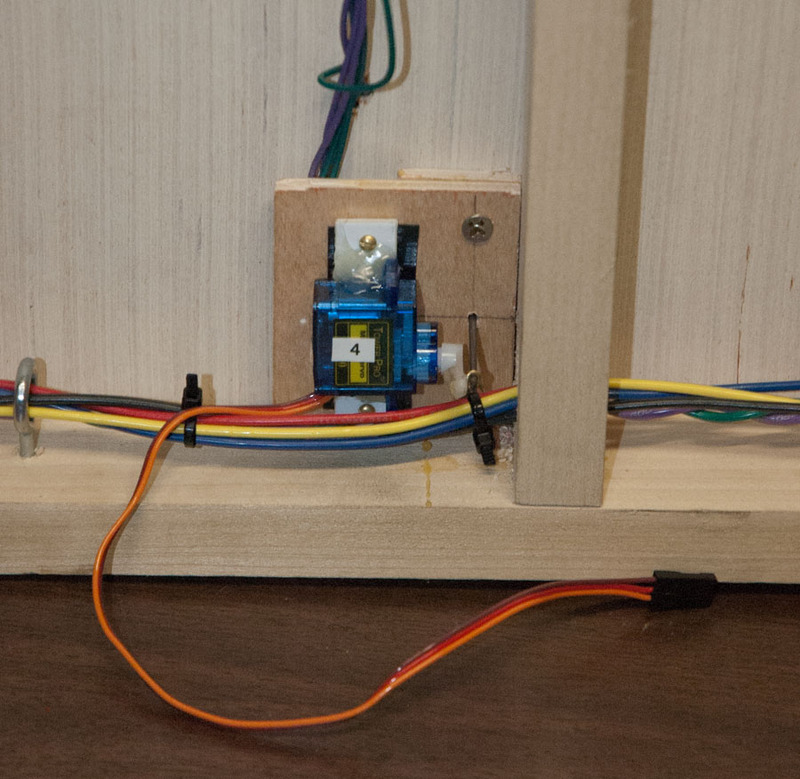 Using 1/16″ music wire the servo is able to move a sprung turnout smoothly. I took a few springs out before I realized it was completely unnecessary. At this point I made sure the rods could move the points properly. In a few cases, the fulcrum hole was a little too large because of sloppy drilling; the easy solution is to fit a plywood plate with a fulcrum hole in the right diameter over the old one. Preparing the servo requires testing and setting it to the 90 degree position. Then with the case on its side, orient the output shaft to either the right or left (which ever you need for a given situation) and install a standard single arm horn pointing up, perpendicular to the case. The offset shaft allows you to select the right orientation. In either case, 0 degrees is 1/4 turn to the right of center, 180 degrees is 1/4 turn left of center. If only micro servos came with side mounting tabs instead of just the ones on top. They do not. To do a side mount like I’m doing you need only fabricate two parts: 1) a strip of .080″ styrene, cut to about 2″ x .5″ and predrilled with holes at each end to accommodate mounting screws; and 2) a piece of 1/32″ brass wire with a loop (a little over 1/16″ inside diameter), a short straight section (about equal to the thickness of a servo horn) leading to a 90 degree bend and a longer straight section. These two parts allow you to side mount a micro servo, and connect its horn to a rod. 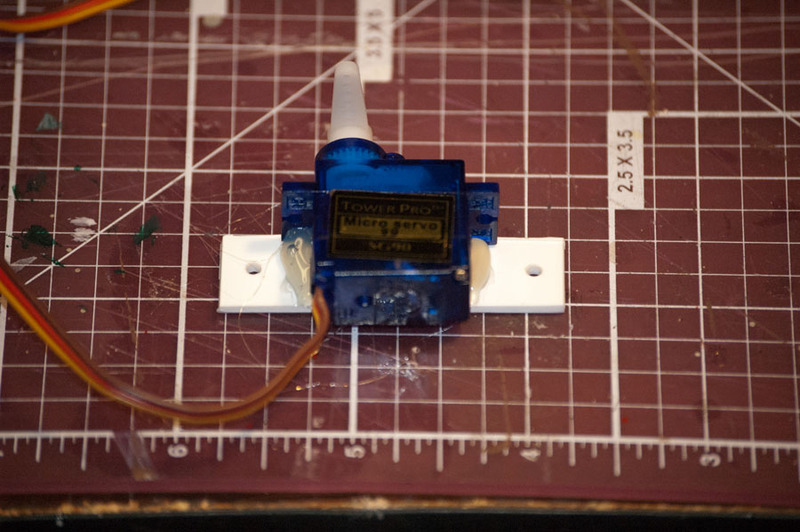 First I remove any labels on the side of the servo that attaches to the mount, then I put a dab of hot glue on the servo and press the styrene strip against it, centering and aligning the strip with the built in fins. 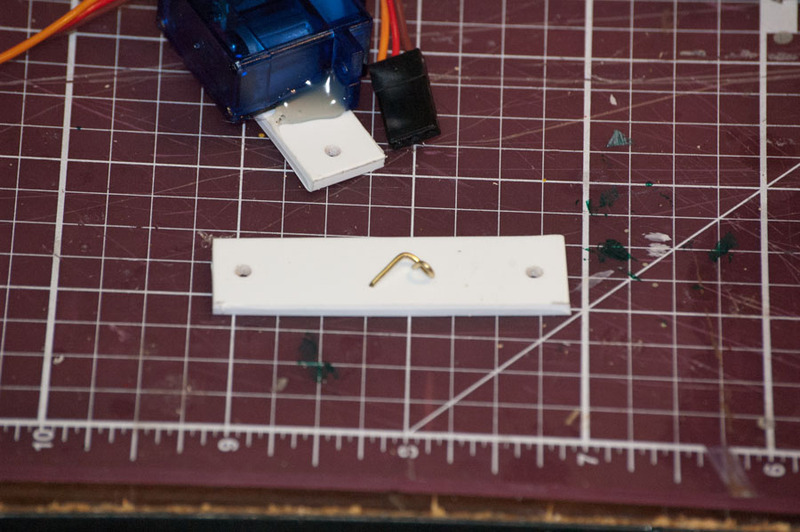 Then I put a bead of hot glue down each side of the servo where it joins the mounting strip. Its probably overkill, but I want the servos mounted solidly and resistant to torsional stress. 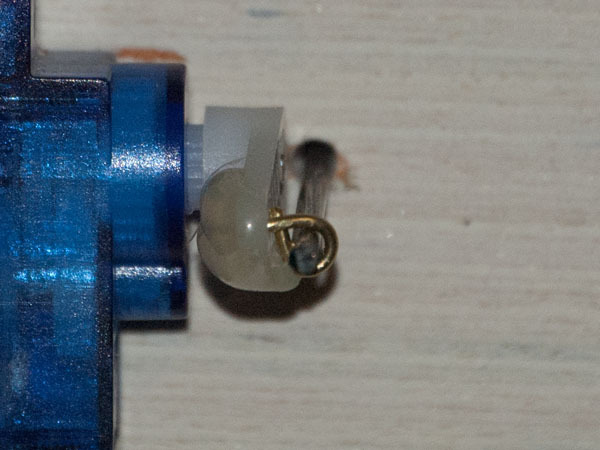 Micro servo glued to a side mounting strip. The brass wire is threaded through the top hole of the horn, with the long leg aligned along the length of the back side of the horn and the loop parallel to the base. Apply dabs of hot glue to adhere the wire to the horn. Here you can see how the brass wire is threaded through the top hole glued to the horn, and the turnout rod is threaded through the loop. Note the clearance between the rod and the horn. 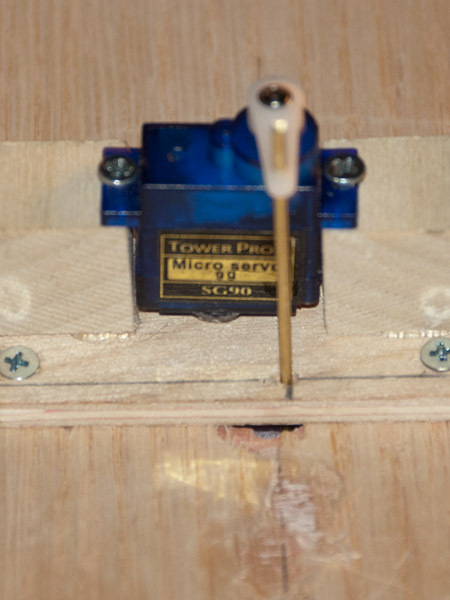 Here a servo has been aligned to the motion of the rod, marked on the plywood. First it is necessary to determine the plane along which each rod moves; that will depend on the angle of the turnout relative to the rest of the layout. 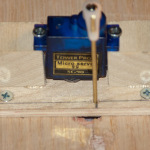 With the plane of motion marked and the rod set to its 90 degree position, I slip the rod through the loop glued to the horn and place the servo next to the rod, parallel to the plane of the rod. Placing just a little tension on the rod and maintaining even clearance between the horn and rod, I mark and drill mounting holes for the servo. Sometimes its easiest to do one mounting hole, attach the servo at that hole then—after adjusting positioning—drilling the second hole and completing the mount. After a test fitting, I remove the servo and apply a strip of 3/4″ Rubber Splicing Electrical Tape (Scotch #2242) to the bottom of the mount to inhibit noise transmission. I remount the servo in its final position. Servos 1, 2 and 9 in their final positions. The location for turnout 4’s servo. Turnout 4’s rod comes down at an awkward spot, close to a frame cross member, the edge of the layout, the main wiring bundle and three feeder sets. The feeders are the main problem; I should have located them further from the turnout. While moving the feeders is an option, I also realized that the fulcrum hole was too large so I was going to have to put in a new fulcrum plate anyway. The solution I came up with was to fabricate a mounting plate from a couple of pieces of scrap plywood, that would provide a new fulcrum and cantilever over the feeders. Everything screws down so that it is removable and repairable. 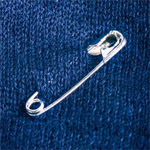 Mounting solution for Turnout 4. Turnout 4 Servo Mounted. 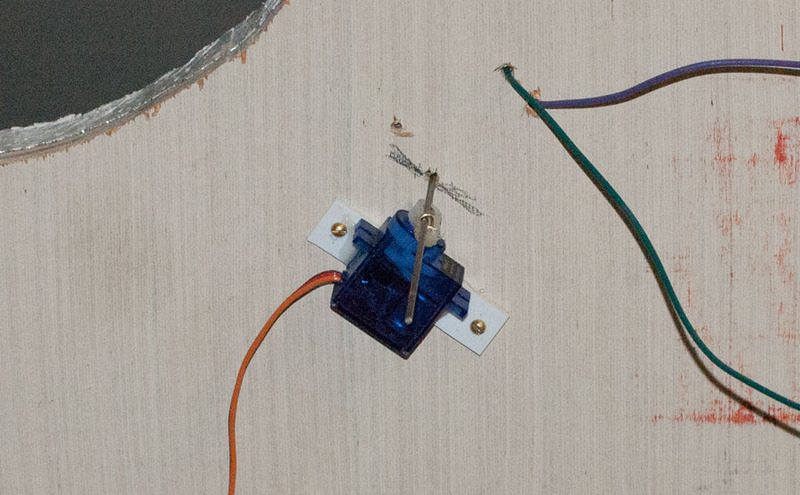 The horn swings UP to change the position of the points (as oriented in this photo), so the wire bundle below the servo does not interfere. Its snug but effective. On this module and level it takes approximately 20 – 30 degrees movement of the servo to change the points. Once I determined that, it was easy to calculate initial positions that could then be fine tuned for individual installations. I’m using CadRail’s layers to record information. Here I’ve recorded feeder positions (in red; turntable area not yet built) and turnout servo positioning data (green). The two positions are “S”, straight or Mainline; and “D”, divergent. The goal is to have the points firmly pressed against the rails at each end of their travel, without making the servo work so hard it gets noisy. A light hum while the servo is holding a position is OK; but it should not become a loud buzz and the servo should not feel “buzzy” to the touch. 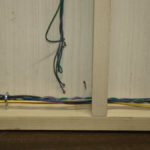 Try moving the turnout manually – you should get resistance to moving the points against the servo, but the flex of the music wire should still be evident. Tinker with this for a while and you’ll start to get a feel for it. Next step is a big one: install the turntable mechanism, install the Roundhouse base, lay track, and so on. Until then, happy railroading! 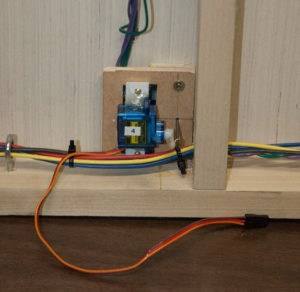 This entry was posted in Construction, Electronics, Materials, Space Constraints and tagged Layout Wiring, micro servo, Power Management, servo mount, Track Laying, turnout motor. Great! I’m going to try to use these servo motors too, though I’m modeling in HO scale. I’m curious how much vertical space these now require in the low-profile “side mounted” version. I’d like to rest my lowest layout level on top of a cupboard, so I need to know how much clearance to allow. Thanks! Good question. That particular limitation applies to the original trinket; the trinket pro uses the ATmega328 so it is like the Arduino Pro Mini. I would go another direction and suggest you look at the Adafruit 16-Channel 12-bit PWM/Servo Driver https://www.adafruit.com/products/815. 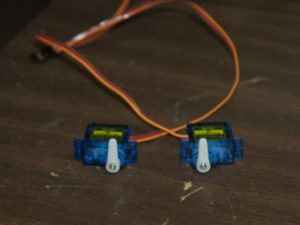 It is compatible with the ATtiny85 and requires only two logic connections to control 16 or more servos (16 per board, and the boards are chainable). I just finished testing one with an UNO, found it very satisfactory, and will be blogging about it in the next few weeks. Adafruit has a software library for it that should work within the limitations of the ATtiny85. The library works a little differently than the standard Arduino servo library. Positioning functions ask you to set the PWM pulse length directly, instead of specifying the position by degrees. The tutorial is straight forward, including guidance on using the map() function to convert degrees into a PWM pulse length. What i found is that setting the pulse length directly improves flexibility in coding to achieve smooth, slow movement. A cool thing about the PWM Driver board is that you can also use it to light LEDS with PWM — giving you total control over brightness, allowing fading in and out and other effects. So any outputs you have left over after the servos are connected can be used productively. 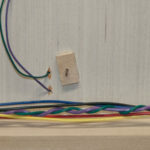 When connecting an LED to a driver output, you’ll only use the PWM and Ground connections (and not the +5 volt connection required by servos). The driver board does all the maintenance; no interrupt routines required. My only reservation about the trinket is that the driver library will soak up most of your memory, so you can’t do much more than control the board and whatever is attached to it. Also, the lack of pins will make it challenging to connect more than three or four buttons. That may be enough for your use case. If not, a multiplexing solution for connecting more buttons will be necessary.